With two sons in high school, I’m increasingly philosophical about the issues I’ve faced as a mother, wife and working woman. For these reasons, Facebook COO Sheryl Sandberg’s 2010 TED Talk, upcoming book and subsequent press onslaught have fascinated me. 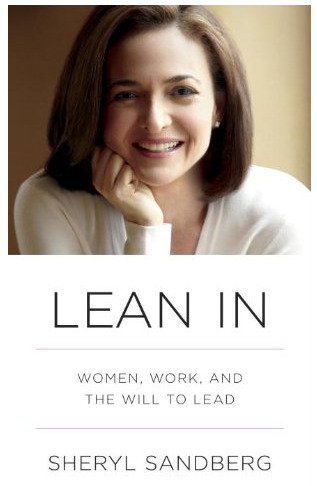 I am conflicted about her message, but ultimately I have decided she should probably just back away from the “leaning in” stuff.Why? Sheryl Sandberg is an outlier. I wholeheartedly believe that those blessed with great talents and power can and should use their pedestal to push for change for those that can’t. But I think that what Sheryl legitimately sees and feels in her life is just too far afield from the reality of working women everywhere. By setting herself up as The Voice for keeping mothers in the workplace, but ignoring the issues that most working mothers are facing, she’s missing a much bigger opportunity. She is talking to a very small subset of women. Lean in, sit at the table, don’t check out. Yes, OK. Fine. But if she wants a broad audience, she needs to start talking about more substantive issues that affect a broad swath of working mothers. My perspective is unique because I was married right after college and had my boys shortly thereafter. I was at the very beginning of my career (read: not much money or power). Now, after 20 years of a career in media and startups, I’ve progressed too far to relate to most of the working mothers in America. I look more like Sheryl, aside from her bank account. I have flexibility, a network, options, money to help with the problems that arise. I have worked for progressive companies. But I look back to my 25-year-old self in Milwaukee, Wisconsin, to really understand the issues facing working mothers. At 25, a young professional with a new baby, this is what I know. I was paid “disability” for six weeks off. At six weeks, you are barely holding it together with a first child. I don’t need to cite how this compares to every other industrialized country, right? My husband was a reporter and while paternity leave was a thing, it was definitely frowned upon and still is in many professions. He had one day off. We blew through our very meager savings so I could stay home for three months. My husband changed shifts to work nights so we didn’t have to do daycare, because we had no money. It was a mad sprint. Always. It was exhausting and not very rewarding. What I wanted more than anything was frankly to lean back. We had no help. We had no time. I never saw my husband. 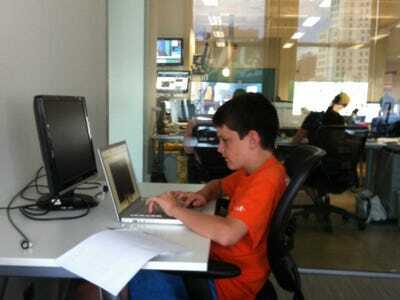 Here’s my son hanging out in the Business Insider office. As a working mother, many vacation days were taken with caring for a sick baby. Flexible hours were not, and are still not, part of the working culture. Work has infiltrated the homes of almost all of us. But it is not great for a woman’s career to bring the home into work. I can remember many days locking myself in the bathroom and sobbing with worry over something with my sons and knowing I should be home with them. I remember breast-pumping in a broom closet. I remember literally sneaking out of the office to see a school play. And this was not a factory where I was working. This was as good as it gets for young women in junior roles. I know it’s hard to believe for those of us in our progressive coastal bubble, but it’s hard out there for a mum.And what makes it worse for women is that it is even more difficult for men in the work culture to leave for doctor appointments, school plays and sick babies. In Middle America, in a blue-collar job, a guy says “Hey, I’m going to need an hour to take Tommy to the dentist.” That does not happen, people. This is why women shoulder the burden. These are workplace issues, not bad choices women make. By focusing on women’s actions, not the workplace environment, Sheryl’s missing the point. Women aren’t leaning in and staying at the table because the trade-off for the more satisfying career takes too great a toll on the people you love. And frankly, the path to the executive corner office that Sheryl describes is not the holy grail. Let’s be real: the jobs of which she speaks — C-level tech jobs at Fortune 500 companies — are the least flexible, most hostile environments and who has the time to change that culture. I obviously agree with her that the world would be better served if more women were in power. But instead of sending in these poor women as corporate missionaries who have to live miserable existences to make incremental change, I think the smartest women and men should start rejecting these opportunities. When it becomes increasingly difficult to recruit top talent to these roles again and again, because both genders acknowledge that the job is “family-hostile,” it might make an institution look inward toward systemic changes. This is very different from grudgingly making a few exceptions to placate the new hotshot hire. This just might trickle down to affect the average working mother. This is the win. This is the huge and important opportunity that Sheryl is squandering. In the meantime, here’s my TED Talk to women considering keeping a career and becoming a mother: this is a marathon, not a sprint. (Actually, it’s more like one of those crazy extreme runs where you jump over fire and crawl under barbed wire, but well, nevermind). You can lean back, jump an obstacle, go sideways, zig and zag. Over my career, there were many times I could have “put my foot on the gas pedal.” But in a family with two parents working outside the home, there is the ever-present algorithm of personal fulfillment, family sacrifice, money, and time. It’s like the old “time, quality, price” puzzle; pick two. In 1998, we bought and renovated a home in the inner city and frankly, I barely paid attention to my career that year. I quit a startup job that was screwing up my family and moved up to the Adirondacks for the summer with my boys to hunt waterfalls. If you keep intellectually pushing yourself, working hard, learning skills, finding mentors, developing professional friendships, you’ll progress. Do I believe in my heart if I focused singularly on making it to the highest echelons of my career that by now I could have? Absolutely. But I love my job. And I really enjoyed those waterfalls. Bridget Williams is the Senior Vice President of Business and Audience Development at Business Insider in New York City.